On 23 January 2019, ASEAN-China Centre (ACC) held media networking meeting among media officers of ASEAN embassies in China, ASEAN media in Beijing and Chinese mainstream media at ACC Secretariat. Mr. Chen Dehai, Secretary-General of ACC, Mme. Wang Hongliu, Director of General Affairs and Coordination Division of ACC, Mr. Guo Chuanwei, Director of Trade and Investment Division, Mme. Zhou Hui, Deputy Director of Education, Culture and Tourism Division of ACC, and Mr. Wang Zhiquan, Deputy Director of Information and Public Relations Division of ACC, media officers from embassies of Brunei, Indonesia, Lao PDR, Malaysia, Myanmar, the Philippines, Singapore, Thailand and Viet Nam, journalist from the Star of Malaysia, representatives from China Daily Online, People Daily Online, Xinhua Net, China Network Television (CNTV), Huanqiu Online, China Report, China Daily, China Youth Daily, China Radio International, 21st Century Business Herald, The Paper, Tencent, Toutiao, ACC Wechat Service Provider, Communication University of China (CUC), totaling over 40 participants, attended the meeting. Secretary-General Chen Dehai thanked all participating partners for their strong support to ACC in the past year. He pointed out that since the year 2019 is designated as the ASEAN-China Year of Media Exchanges, media is expected to play a greater role in promoting ASEAN-China relations. He hoped that the two sides would enhance mutual understanding and make joint efforts to continuously deepen ASEAN-China practical cooperation in media. 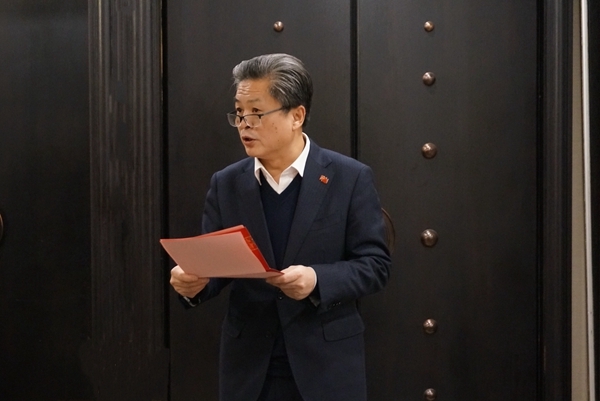 Deputy Director Wang Zhiquan briefed on ACC’s planned major projects in 2019 in the field of information and public relations. He stressed that by holding this meeting at the beginning of the new year, ACC hoped to solicit opinions and suggestions of all parties and provide an opportunity for face-to-face communication in pursuit of smoother cooperation in more areas while lifting ACC’s media and information work to a new level. Given that Thailand is the rotating chair of ASEAN this year, Mr. Ratthawoot Nanthaikuakool, First Secretary of Thai Embassy in China, delivered remarks on behalf of ASEAN embassies in China. He spoke positively of the results ACC achieved in promoting friendly exchanges and practical cooperation in the field of information and public relations in 2018, and noted that Thailand, assuming the ASEAN Chairmanship 2019 under the theme of “Advancing Partnership for Sustainability”, is committed to promote the overall development of ASEAN-China relations in various areas. Media will play a significant and active role in realizing the goal. This event was held in a timely manner in the sense that it kept partners updated about ACC’s work plan in information and public relations in 2019, which would not only facilitate coordination of work planning and alignment of project implementation between the two sides, but also build a platform for communication and exchanges and expand the network of both sides. He hoped that media of ASEAN countries and China would support each other and make joint efforts for greater closer media cooperation between the two sides in 2019. During the meeting, representatives from ASEAN embassies in China, the Star of Malaysia, Chinese major media organizations, ACC Wechat Service Provider and CUC respectively outlined their work priorities in media in 2019 and put forward suggestions on potential cooperation projects with ACC. The participants also had in-depth exchanges on strengthening media capacity building, jointly coping with the challenges in the new media era, establishing platform for direct exchanges, carrying out media dialogue, making the media stories more relevant to people’s daily life, enhancing people-to-people connectivity, giving full play to the roles of new media platforms such as Wechat and short video and strengthening ASEAN-China relations and promoting the image of ASEAN as a whole. Participants from ASEAN and China all thanked ACC for holding this networking event, saying that such communication was crucial for promoting mutual understanding and practical cooperation. They would make best use of the platform built by ACC and work together to make greater contributions to the development of ASEAN-China relations.